It turns heads, it's fast, it's chic and it's like nothing Princess has ever launched before – the much anticipated revolutionary R35 will be revealed for the very first time in Cannes on 11th September. 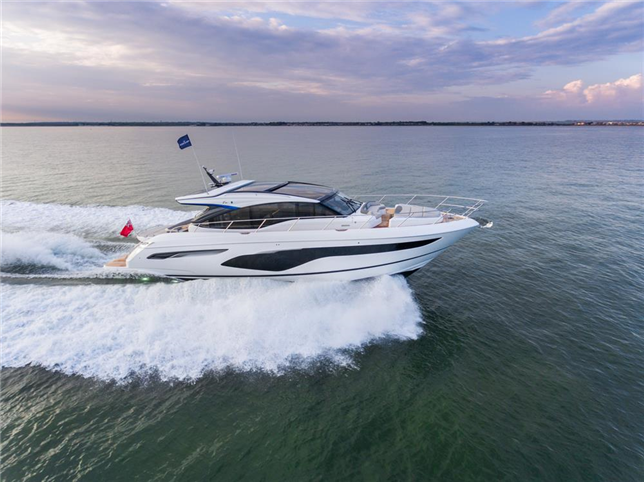 Princess is also continuing its return to V Class open-boating with the global launch of the V60 and further strengthening the well-established flybridge range with the striking new Princess F70. The all-new S78 and V50 which launched at boot Düsseldorf will make their on-water Cannes debut to complete an exceptional 9 yacht line-up. The R35 is the first Princess R Class performance sports yacht. 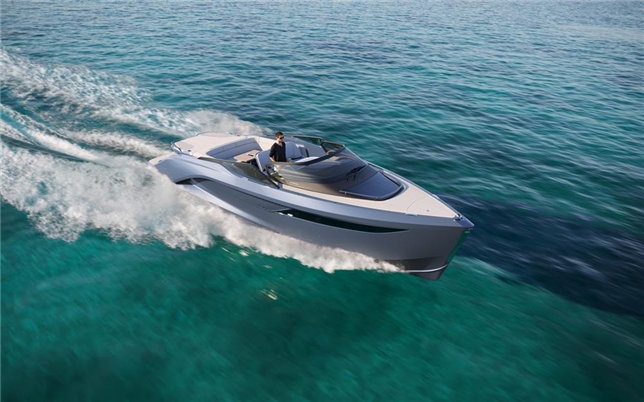 Designed and hand-built in Plymouth, England, it combines revolutionary performance capabilities, stunning design, quality, and race-bred technology to deliver a unique on-water experience up to 50 knots. 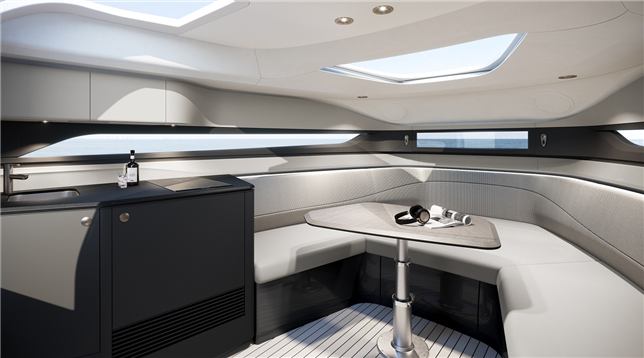 And with the exceptional performance delivered via the new Princess Active Foil System and carbon innovation, the cabin reflects Princess's expectation that owners and occupants will have an increased desire to stay aboard and therefore delivers the most luxurious of surroundings. A bathroom with wet-room shower allow comfortable days at sea, while the U-shaped seating surrounding a dining table easily converts into a double bed where integrated blinds ensure a good night's sleep. The R35 features a convenient hot and cold shower facility on the aft swim platform too: the perfect place to refresh after a day in the sea. Slightly aft, the practical galley kitchen features a sink, drawers and storage space. Guests can relax in front of a 32-inch LED television*, complete with Blu-ray CD/DVD player* that integrates with the Naim audio system. 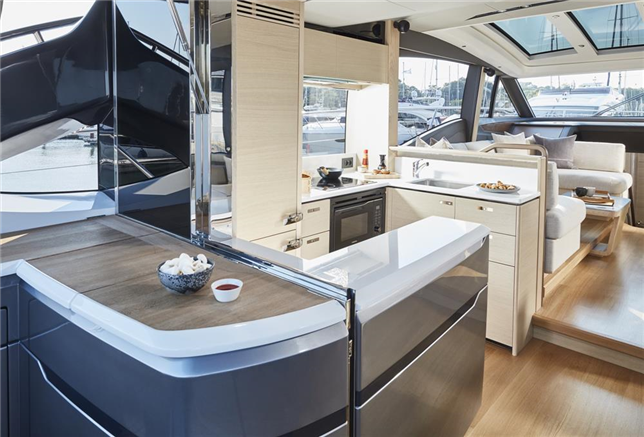 Guests can enjoy true open boating thanks to the electric sliding sunroof in the beautifully appointed open-plan saloon with U-shaped sofa, leading to the aft galley with its generous L-shaped sofa and folding dining table. The sliding doors open out to the expansive cockpit featuring a wetbar with barbecue and coolbox. Here, everyone can dine al fresco, relax on the sunpad, or enjoy watersports from the bathing platform – the electro-hydraulic garage door hides a 3.3m tender. For those who wish to find a little privacy on board the generous foredeck has a seating area and forward sunbathing area with the option of a large sun awning. Below, three cabins host 6 guests. An owners stateroom features a sofa for a moment of tranquillity plus plenty of storage and a private ensuite. A forward double cabin and starboard twin cabin with optional electric sliding bunks share the forward ensuite.  A single crew cabin with ensuite and ample storage is also available as an option. The Flybridge class of luxury yachts has established the Princess brand as a pioneering force. 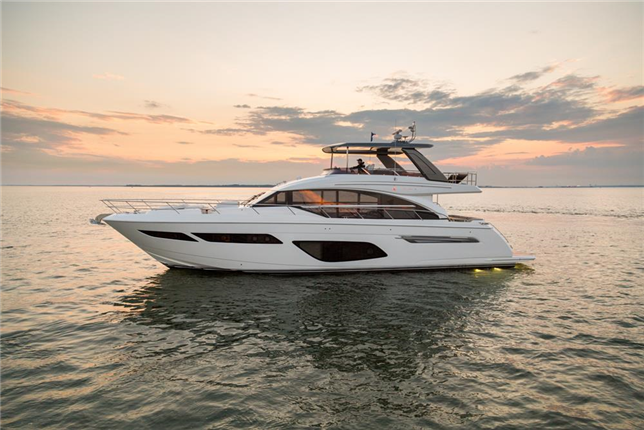 This new Princess F70 captivates with a clean, modern, elegantly proportioned look, which also meets the demand for flexible and practical living. This, coupled with its efficient cruising capability makes it truly a Princess. On the main deck, an aft galley arrangement opens out towards the cockpit, offering a sociable al fresco dining solution with a more formal dining table in the saloon, easily isolated into two separate spaces, thanks to large glass sliding doors. Huge panoramic windows flood the space with natural light and bring the outside world in. 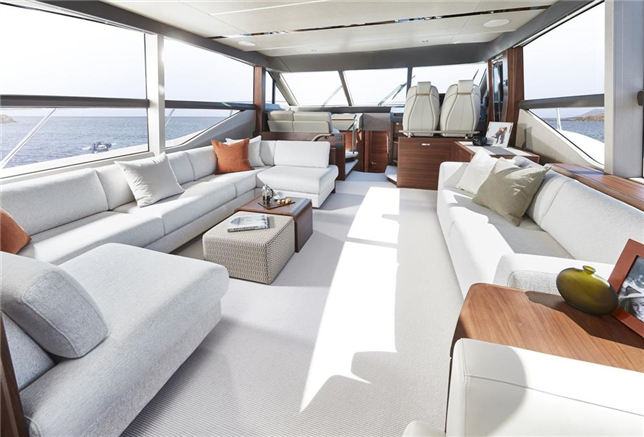 On the foredeck, there is a forward facing sofa and optional coffee table, as well as a spacious sun pad – the perfect private space to enjoy an aperitif and watch the sun go down. The Flybridge class is known for its focus on enjoyment combined with efficiency, attributable to the variable deadrise hull form, which provides greater lift and less drag, enabling her to achieve lower planing speeds while still reaching up to 36 knots† with her MAN V12 1400mhp engines. Princess Yachts look forward to welcoming visitors to the Cannes Yachting Festival 11th – 16th September at Jetée 002 to view the full line-up including the S60, Princess 55, Princess 62 and Princess 30M. It turns heads, it’s fast, it’s chic and it’s like nothing Princess has ever launched before – the much anticipated revolutionary R35 will be revealed for the very first time in Cannes on 11th September. Princess is also continuing its return to V Class open-boating with the global launch of the V60 and further strengthening the well-established flybridge range with the striking new Princess F70. The all-new S78 and V50 which launched at boot Düsseldorf will make their on-water Cannes debut to complete an exceptional 9 yacht line-up. And with the exceptional performance delivered via the new Princess Active Foil System and carbon innovation, the cabin reflects Princess’s expectation that owners and occupants will have an increased desire to stay aboard and therefore delivers the most luxurious of surroundings. A bathroom with wet-room shower allow comfortable days at sea, while the U-shaped seating surrounding a dining table easily converts into a double bed where integrated blinds ensure a good night’s sleep. The R35 features a convenient hot and cold shower facility on the aft swim platform too: the perfect place to refresh after a day in the sea. Forward in the saloon are two more seating areas, as well as a 49″ LED TV and entertainment system. A pantograph door allows the helmsman easy access to the side decks from the helm station; sleek and equipped with top-of-the-range Raymarine touchscreens and plotters. The lower deck boasts 4 beautifully-appointed cabins, including a full beam master stateroom aft with a dedicated private staircase, a forward VIP guest cabin and 2 twin cabins. Windows throughout the lower accommodation areas ensure the cabins are bright, and opening portholes allow fresh air in to all the cabins.